Be prepared for blowing dust in some areas. 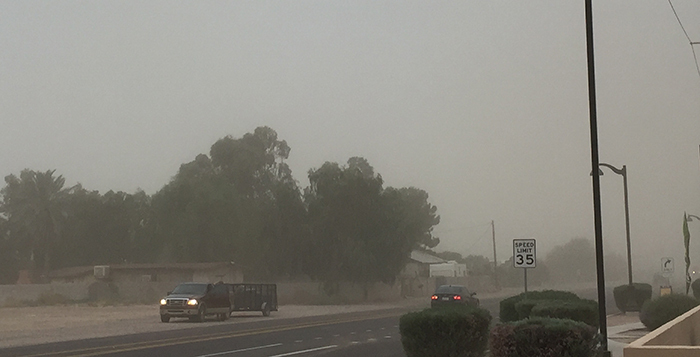 The National Weather Service issued a red-flag warning and high-wind advisory that is in effect until 8 p.m. as strong winds and blowing dust are expected in Maricopa. Maricopa’s overnight low will be around 51. The winds across the state are expected to lead to widespread hazardous conditions for fires. · Avoid driving into or through a dust storm. · If you encounter a dust storm, check traffic immediately around your vehicle and begin slowing down. · Pull off the roadway as soon as possible; don’t wait until poor visibility makes it difficult to do so safely. · Completely exit the highway if possible, away from where other vehicles may travel; don’t stop in a travel lane or in the emergency lane. · Turn off all vehicle lights, including emergency flashers. · Set the emergency brake and take your foot off the brake. · Stay in the vehicle with seat belts buckled and wait for the storm to pass. Saturday is expected to be sunny again with a high near 81. Breezes get build up to 20 mph. Saturday night, expect a low around 52 degrees. Sunday again has a sunny forecast and a high near 82 degrees. Winds will be down around 5 mph. Overnight skies are predicted to be clear with a low around 55. That is expected to lead in to warmer temperatures to start next week.